Thoreau went to the woods to live deliberately, but future inhabitants of Villa Altona will live in the woods with deliberate style. 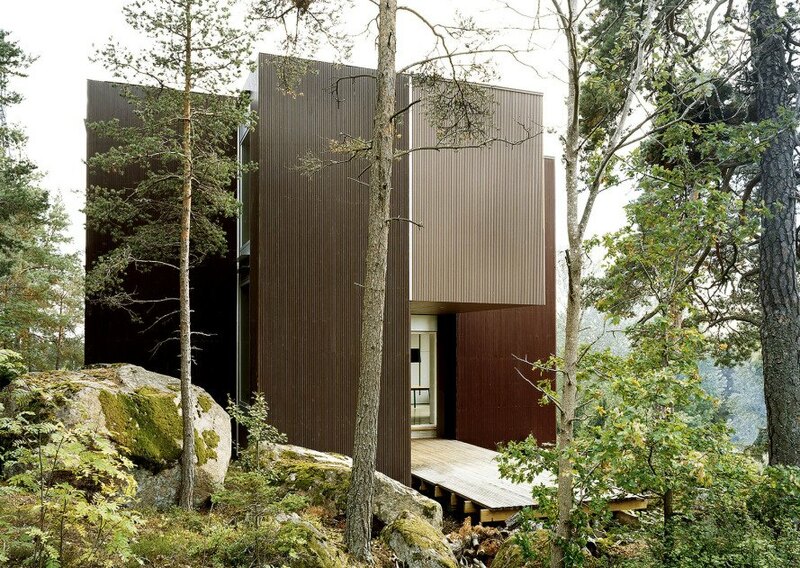 Stockholm studio The Common Office has designed a cliffside villa in Törnskogen, Sweden that smoothly blends the natural world with modern comfort and design. The designers envisioned Villa Altona as a Lego-like structure composed of interconnected blocks. Because the home is built into a steep rocky cliff with large boulders dotting the site, the block concept enabled the designers to adapt to the difficult terrain. Open floor plans, facilitated by the block structure, create wide open space on the ground and upper floor. At the center of the design is a large skylight, an important feature near Scandinavia’s sunniest capital, Stockholm. Sweden’s capital receives more sunlight than London or Paris and in the summer, the sun can shine on Stockholm for up to eighteen hours. Metal grates are built into the floors to allow sunlight to penetrate the lower levels. The two floors are connected by a central spiral staircase, which leads to two bedrooms. 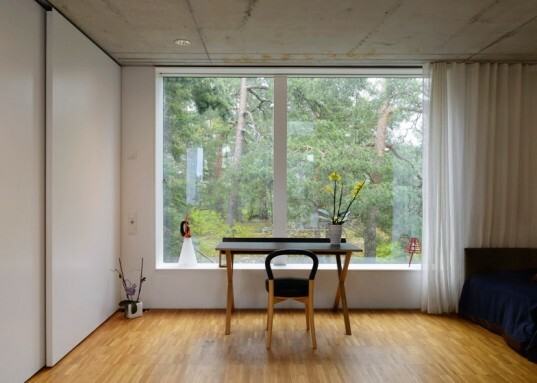 “The interior is almost one continuous room,” says Torres. “The building units offset relative to each other creates smaller private spaces within the large room.” Further up the stairs, there is access to a rooftop garden planted with herbs and sedums. Appropriately exterior paneled with timber, Villa Altona was built along an east-west axis to allow strong sun exposure and to provide dramatic views. Exterior, from the cliffs below.